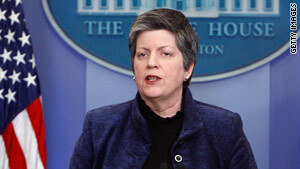 Homeland Security Secretary Janet Napolitano on Thursday discussed the attempted Christmas Day terror attack. Washington (CNN) -- Former President Reagan used the signature phrase "trust but verify" throughout his presidency. That sentiment still holds true, one expert said, especially as the United States looks to fix flaws in its intelligence system in the wake of the attempted Christmas Day airliner bombing. "If it's hard to share information among our own counterterrorism agencies ... imagine what's going to happen if we try and share intelligence with other countries," said Ken Ballen, president of Terror Free Tomorrow, a nonprofit research institute. On Thursday, the White House released its report on the plane terror plot by al Qaeda in the Arabian Peninsula -- which has taken responsibility -- and the suspect, Umar Farouk AbdulMutallab. President Obama, in speaking about the report, said the U.S. intelligence community had the information about a possible attack by the group -- and information about the suspect -- but failed to "connect the dots." At a press conference later in the day, Homeland Security Secretary Janet Napolitano said she would soon head to Spain to meet with her European counterparts to discuss security issues. "Working with the Secretary of State [Hillary Clinton], we need to strengthen international security measures and standards for aviation security," Napolitano said. "Security measures abroad affect our security here at home." One challenge for the United States is not only cutting through the bureaucratic red tape within U.S. counterterrorism agencies, but also connecting better with foreign intelligence. Ballen, a former federal prosecutor with more than 20 years in law enforcement and international relations, argues that mixing U.S. intelligence with information from foreign governments could get messy. "The problems are magnified when you involve other intelligence agencies," he said. "In our own government we have bureaucratic issues between agencies." As for sharing classified information with other countries? It's going to be tough, Ballen said. "There are limits to what we can share. And they've had the same issues. They have issues of having highly sensitive information that they may be wary of sharing with us." Administration officials, though, have pointed out that the United States has worked successfully with foreign governments in stopping terrorist attacks and rooting out terror cells. But there are also big trust issues. "You're dealing with some intelligence agencies where the United States has a mixed record of cooperation and I think of the Pakistani ISI [Inter-Services Intelligence] as an example of that," Ballen said. "We've cooperated with them over the years, but there are certainly issues of trust between us and the Pakistanis." Steve Serrao, director of law enforcement solutions for the international firm Memex, said trust is dependant on a "a long-standing cultural or organizational distrust based on previous activity or current activity." "But overcoming that issue is significant ... [it's important] to trust another agency or another government so much so that you can share even unclassified law enforcement information," he added. The December suicide bombing at a base in Afghanistan that killed seven CIA operatives illustrates the challenges of sharing information with other governments. A former U.S. intelligence official said the bomber was acting as a double agent for al Qaeda. He was recruited as a counterterrorism intelligence source, according to a senior Jordanian official. Jordanian and U.S. intelligence agencies reportedly believed the bomber had been rehabilitated from his extremist views and were using him to hunt Ayman al-Zawahiri, al Qaeda's No. 2 figure, the former intelligence official said. Serrao, a 25-year law enforcement veteran, works with foreign governments such as Mexico and Belize, and noted that one of the more significant challenges -- as found in the White House report -- is having the information sifted, coordinated and acted upon. "We can connect [information] systems. We can provide technology to these other governments ... we can make sure these other airports have the same security measures we have ... but if no one is taking action, that will always be the hole in the system." Part of fixing the hole, Napolitano said, will come from greater cooperation, something weighing heavily on the administration. "The Department of Homeland Security has had outreach efforts into different populations, Muslim-American populations, Somali communities across the United States over the last years, trying to build bridges so that there's good communication between us, even in the face of those who would distort a religion for terrorist purposes," she said. "We need to look at strengthening those activities."